The new improved Rules of Golf started with a flourish at the Sentry Tournament of Champions last week and included players putting with the flagstick in; making penalty drops from knee-height; and one player avoiding a previous penalty for stepping on his own ball. What was your take on what you saw? What worked and what didn’t? Jim Deeks, Fairways Magazine (@jimdeeks): To be honest, I didn’t notice. Which may be partly explained by the fact that I either slept through the broadcast or watched in a similar state of stupor as Jack Nicholson on painkillers in About Schmidt. But aside from the rules the governing bodies shoulda altered, but dint, I’m all for the new ones and I won’t have much respect for any pro’s who whine about them. Craig Loughry, Golf Ontario (@craigloughry): Was great wasn`t it? Except for DJ playing a wrong ball in a penalty area that was erroneously flagged. He should have identified it before taking a swipe. Live and learn as they say. Overall, I thought it went well. I didn`t mind the putting with the flagstick in, not at all, saw a few made with it in too. No doubt it looked odd dropping from knee height, looks awkward, but if you go back to the over the shoulder-dropping behind your back, that looked pretty odd too. It evolved to dropping from shoulder. I assume this will look less odd a couple of years from now. Michael Schurman, Master Professional / Life Member, PGA of Canada: Of the millions of people playing golf around the world, the only people who were not using the new rules prior to Jan 1/19 are the USGA and Professional Tours. All the new rules are exactly how any logical person has been proceeding for years. The changes are a welcome relief to a whole book of Supreme Court-like cases called the ‘Decisions’. There is one HUGE ‘can-of-worms’ that was opened though; the thought of bifurcation. The new rule regarding an OB ‘drop’ instead of ‘playing a stroke’ being accepted as a local rule – BUT NOT IN COMPETITION – paves the way for a difference between casual play and tournament play and that my friends is about time! Dave Kaplan, Freelance Writer (@davykap): I’m not going to lie. I don’t start watching golf each year until the Farmers Insurance Open in late January because we are still months away from teeing off up here in Ontario and watching a Hawaii tournament in the first week of the calendar years seems like a cruel joke. So, I didn’t see how any of it played out, but I like the flag-in rule and I’m looking forward to players using it to their advantages on windy days and downhill putts. TJ Rule, Golf Away Tours (@GolfAwayTJ): Well, what I did see was a bunch of pros complaining that the new rules weren’t clear, but c’mon, it’s not rocket surgery! I don’t think they are that complicated, but it will take a while for players to be confident making a decision on the course without a rules official within shouting distance. So, in the short-term, the new rules will likely slow down play, but hopefully that doesn’t last long. I will be interested to see how the players determine when to leave the flagstick in. Why not follow whatever Bryson does, since he studies the most stats relating to each situation on the course. If he thinks leaving it in for putts over 10 feet, then I’m following his lead. I think Dave Pelz once said something similar. Bryson even considers what type of flagstick the course is using and probably thinks about how much rain is on the flagstick when he putts, because that probably makes a difference! Hal Quinn, Freelance Writer, Vancouver: Most of what I saw I didn’t like. (Didn’t watch much because I’ve played that course four times and do not like it. The design, incredible grain — putts break uphill — and ridiculous wind (I hit a 235-yard six iron) make it a guessing game, not a golf game. Crenshaw and Coore are blowing it up and trying to fix their mistakes.) Really didn’t like watching DeChambeau leaving the flagstick in on a four-footer setting the standard for hackers worldwide. The new ball drop should be called ‘ball placement.’ Liked seeing green damage tapped down, but the Rules nerds not admitting that divots are ground under repair negates most of the new “interpretations.” Don’t think any of it will have any impact on the main issue, pace of play. Peter Mumford, Fairways Magazine (@FairwaysMag): Dropping from knee height looked weird. Maybe that rule should be changed to say “no lower than knee height” so if you still want to drop from shoulder height or waist height, no problem. As far as the flagstick is concerned, I’m a believer in keeping it in on long putts but on short putts, I think the hole looks bigger with the pin out, which gives me more confidence. That may fly in the face of Dave Pelz and Bryson DeChambeau’s fact-based science but this isn’t climate change we’re talking about – this is a three-footer to win a skin! The PGA Tour also introduced the concept of interviewing players on the course between shots. Is this something you want to see? Do you think players will like it? Are we likely to get any useful information? Deeks: Well, if the players were capable of something interesting, or colourful, or intelligent, or controversial, yes, I’m all for that, too. But Aaron Oberholser interviewing Marc Leishman early in the round, when Leishman was already four shots back, was about as interesting as hearing the guy in front of me at A&W ordering the new Mama burger. Somebody — i.e., the Tour — needs to give these guys some coaching in Being Interesting. But of course, the Tour is the probably the blandest, least colourful sports body in the universe, so they probably think Leishman nailed it! Loughry: Interviewing during play was OK. No doubt players must volunteer to do it, and I doubt any will when we want to hear from them (heat of battle down the stretch or after a disastrous hole. But if they did, it would sure be fun, and someone better have their finger on the censor button. Schurman: In 1972 I wrote to the PGA Tour Commissioner Joe Dey with two suggestions. First, players should be interviewed during the round and second the ‘top 60 money winners should be divided into 2 groups of 30, Group A and Group B. The PGA Tour would guarantee (as a minimum) that Group A would play in a certain Tour event. Next week, they would guarantee Group B as a minimum. Next year the events would rotate so every 2 years a player MUST enter an event. His answer was “The players can’t be disturbed during a round”. Second, the players are independent contractors and can’t be mandated to play an event. It only took 50 years. Kaplan: Again, I didn’t watch any golf this week, so I don’t know if this translated well from the whiteboard to the golf course, but I like the idea of players being asked about specific shots immediately after hitting them, especially if they botched their attempts and are rattled over the mistake. Rule: I don’t think the players will like it, but let’s face it, they are in the entertainment industry. And whatever makes the fans happy and brings more eyes to the tv coverage, makes the players more money! In baseball they interview managers between innings and it adds something to the telecast. I can’t wait until someone gets asked to comment on his playing partner’s slow play during the round, let’s really spice things up! Quinn: The only times I got useful — or interesting — information from a Tour player or any pro athlete came over the course of a lengthy one-on-one interview. That on-course schtick is as useful and interesting as NFL sideline reporters recapping what the coach said to them — exclusively — as they jogged to the locker room (we gotta cut down on errors, control the ball, play our game). How would you like it if, while approaching a tough second shot into a tight pin, your playing partner sidled over and asked: “Man, how do you feel about that triple back on the 9th?” It’s just another of the superfluous intrusions on coverage of live action — prefaced with the mind-gnawing; “While we have a moment…” – that are now the staple of golf on TV. Recording and fast forwarding (hit the ‘MUTE!’) is the only refuge left. Mumford: Total waste of time. The last pro to say anything interesting during a round, or even after a round for that matter, was probably in the Tommy Bolt era. These guys are beyond dull and boring when the cameras are on. Now if you could get them to wear live mics and not bleep out every other word, that would be fun. Every week on the professional Tours we see players charge up the leaderboard as Xander Schauffele did last week at Kapalua, while others falter when faced with the pressure of maintaining a lead or mounting a charge or just winning at all. Pretend for a moment that you are the real Wizard of Oz and can give one player something they require to succeed in 2019. Who would that player be and what would you give him or her? Deeks: I might’ve answered this one above — see, Being Interesting. But verbal dexterity won’t win you a golf tournament, so I’d like to give each of my two favourite players — Spieth and Jason Day — a pair of ruby red slippers, tell them to close their eyes, tap the slippers together and say “there’s no place like home” … but in their case, Home is a place called Restored Confidence. These guys were SO good five years ago, and such fine fellows, that they deserve to be back where they were. Loughry: In the vein of the Wizard of Oz, a heart for Patrick Reed or a conscience or sense of right and wrong would be nice. I’d love to see Tiger starting every hole other than the par-3’s from the middle of the fairway; that would be wonderous. TW needs to bring back the STINGER. Schurman: I always worried that Rory only won when everything ‘lined up’ for him. Somehow, he doesn’t have the same grit Jack, Tiger, Hogan or Lanny Wadkins for that matter. There was an interview on The Golf Channel a few months ago with Jack and Rickie Fowler. Ricky said he was trying to think about majors as being just another week to help reduce the pressure. Jack immediately said “Boy, I never did that! I thought they were the most important golf I could ever hope to play”! Jack: 18 majors and 19 seconds. Ricky: 0 wins. I think Rory has to find a way to ‘bring it’ instead of ‘hope it shows up’. Kaplan: I’d give Matt Kuchar a killer’s instinct, so he could finally close out a major. The man has never won one, despite accruing 11 Top-10 finishes at Grand Slam events since 2010. Rule: OK, let’s be clear, if you’re a DJ fan, you don’t want to give him a brain, that can only hurt his chances. Sometimes it’s good to have the memory of a goldfish (and intellect of a sloth!) on the golf course! If I were to give someone a special power, it would be to give Tiger his 2000 mindset and confidence back. His swing and putting stroke are there, he just needs the killer instinct to return to winning six tourneys including two majors, and let’s face it, that would make for an exciting year! Aside from Tiger, and from a Canadian point of view, since DeLaet is still struggling with injuries, perhaps he could lend his ball striking to Adam Hadwin, who could combine that with his own short game to win multiple tourneys this year and compete in a major or two! Quinn: I’d step behind the curtain and give Rory his 2014 attitude back. It would be great for the game if his concentration on the US Tour this season pays off. My golly he has the swing, the game to again be a major factor in the handful of events that matter. If he had that joy of playing the game that he had way back then, I’d tune in for every minute of coverage — and I think a lot of it would be late on Sunday afternoons. Mumford: If there was some way to get Rory to grow a pair, that would be my gift. His record when he’s in the last group is abysmal. Even in the pre-round interview he said that he couldn’t count on Woodland faltering, so he’d have to chase him down. Then he proceeded to play safe percentage shots like he was protecting a lead. What’s required here is a dash of Lanny Wadkins, whose attitude was win at all costs or go down in flames. 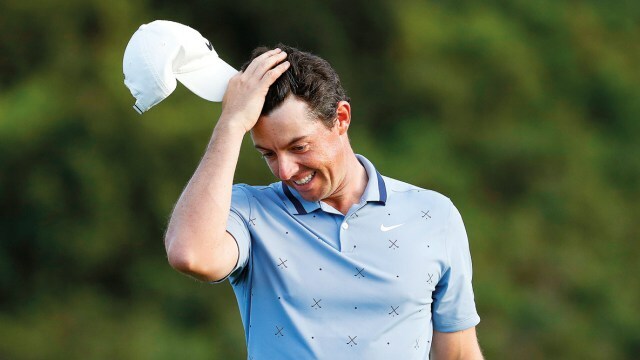 Rory doesn’t need FedEx Cup points or fifth place money. Titles and trophies are what build legacies. Go for the excitement Rory and quit playing like you’re worried about the rent cheque.